There are many dangerous, poisonous and venomous creatures unique to the Australian continent, which include sharks, crocodiles, spiders, jellyfish and many more, among which we have chosen 11 most venomous snakes in Australia. Although not being considered world’s deadliest, around 140 of 270 of Australian snake species are venomous, which makes them 2/3 of whole Australian snake community. Some of the most venomous snakes in the world do come from Australia, but why does that not make them the most dangerous ones also? Because of two reasons, first being that many of the Australian snakes do not often encounter humans, since humans and many snake species inhabit different regions, so the deadly snakebites are actually very rare. Secondly, it is the method of determining which snakes are most venomous, which is not related to deadly bites in humans, but in venom strength. What makes specific venom strong and effective is the mix of toxins it is made of. Interestingly, some researches have shown that composition and strength of the venoms are related to the prey snakes prefer, so different venoms are “specialized” to different kinds of prey animals. Some snakes even change the venom composition throughout their lives, having different venom in juvenile stages and the adulthood. 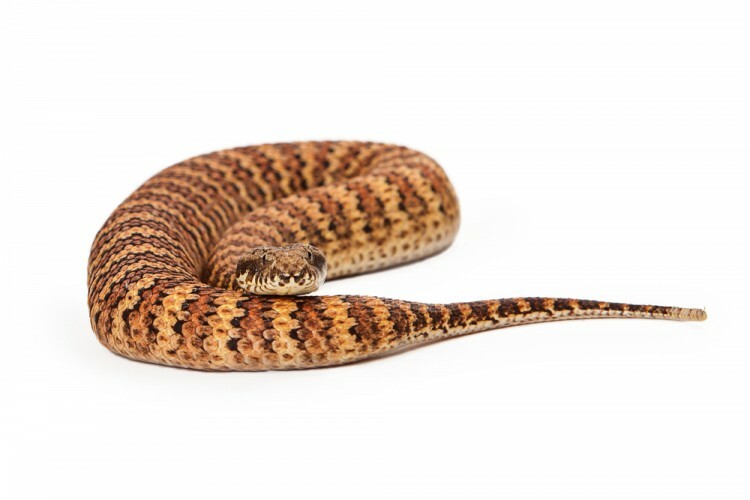 Considering the most venomous snakes, scientists use so-called LD50 value for ranking the venom strength. LD50 is a value that shows how many milligrams of snake venom per kilogram is enough to kill the victim. The experiments are being conducted on mice by injecting a certain dose of venom. The less venom needed to kill a victim, the more venomous the snake is. That means that snakes whose venom has the lowest LD50 value are the most venomous. The resources we have compared, which base their results on the LD50, all agree on Australian species being the most venomous. The resources we consulted and compared, with the LD50 values available were Australian Venom Research Unit, the Wild Classroom and the School of Biomedical Sciences of the University of Melbourne. Having some of the honorable places on our list of 20 Most Deadliest Snakes in the World, Australian snakes do deserve a special topic. Luckily, although being very venomous, these snakes are rarely fatal to humans. Many among them are aquatic species, whose mouths are not built to bite huge prey, therefore they don usually bite people. Let’s take a look which are the most venomous snakes in Australia.